Apple's financials recently saw its share price dip and much conjecture about Watch "flopping". However, consider this: John Lewis, Britain's key retailer in the premium tech market, doesn't yet even sell the Apple Watch, yet it's predicting it'll be a big seller for it this Christmas. So, seriously, is Apple Watch really going to flop? There has been speculation ever since Apple announced the Watch, the company's first new product line in almost half a decade, about how it would sell. The iPhone and iPad have both sold in the hundreds of millions and show no signs of slowing down despite fears that both markets are becoming "saturated". Of course, eventually everyone in the world will own an iPhone and (or perhaps or) an iPad and so Apple has to sell something else, too. The Apple Watch, described by the company as the "most personal" device they've ever made, was the cause of much speculation from "Apple watchers". Smartwatches had barely got off the ground when it was announced, with Pebble having sold about a million units and other watches from Sony, Samsung and others doing about the same number between them. Recent speculation, mainly from third­party firms such as Slice Intelligence, is that sales of the Watch, after intense initial interest, have fallen. We can now at least make a guess. In the third fiscal quarter of 2015, Apple made over $10 billion in profit and $49 billion in revenue. Apple Watch's figures were lumped into the "Other" column on their financial results. In Q3 2014, Apple's "Other" section generated $1.6 billion. It jumped to over $2.6 billion. We can assume that's due to the Watch's sales. If we assume iPod sales went down in the same period, that suggests Apple Watch revenues of comfortably over a billion dollars. At a minimum of £300 a chuck, that suggests Watch unit sales of about 2 to 3 million – well below sales for iPad and a drop in the ocean compared to iPhone. Still, not a disaster: a billion dollars is "cool", as The Social Network made clear. However, this isn't the end of the story. John Lewis, among others, see the Apple Watch as a classic Christmas treat, whether it's people buying it for loved ones or themselves. John Lewis is really the key retailer in the United Kingdom for "affordable premium" tech, but initially shrugged off not selling the Watch back in March. Then, John Lewis told T3 they were "happy to wait" for the device which was then available in the UK only through Apple Stores (sort of), with token concessions in Selfridges and Dover Street Market. Clearly there were supply issues with Watch, and Apple wanted to sell it in a way that maximised its profits. John Lewis' tone has now changed, however. Speaking to T3 this month, Jonathan Marsh, head of John Lewis' technology acquisition division, claimed that wearables in general and the Watch in particular would be the "must have" gadget this year ­and bear in mind that John Lewis still doesn't even actually sell the thing yet. Marsh says the retailer is, "working closely with Apple" to bring the device to the store, where it'll fit nicely next to their new smartphone section, done in collaboration with Vodafone. Marsh's "must have" Xmas prediction was echoed by analyst Cantor Fitzgerald, who described it as the "go-­to gadget" of the 2015 "holiday season". Because they're American, you see. A recent article from the New York Times, entitled "Apple Waits as App Developers Study Who's Buying Its Watch," claimed that developers were sceptical of sales of the Watch and whether there are enough people using the platform to justify developing for it. The article notes that there is currently no Facebook, Snapchat or Google apps, for example. This behaviour is, however, not unusual for tech product launches. The iPhone's App Store came online with far fewer than the 3,000 available for the Watch and many developers initially balked at making iPad­-compatible apps. Perhaps the main issue for Apple now is that industry watchers and punters, rightly or wrongly, expect to see far bigger numbers for products. If we assume Watch sales of 2.5 million to date, well in fact the first iPhone sold slightly less well than that, and even the first iPad didn't do much better, in their first quarters on sale. From a standing start (albeit a massively hyped standing start), with well-known supply issues and very limited retail, to $1 billion in revenue in three months is actually quite impressive. To give that a little context, in Q2 2015, HTC had revenues of a little over $1 billion in total, for its beloved slate of award- winning smartphones. Marsh predicts that as Apple iterates, the Watch will become "more of a lifestyle piece" as the general population becomes more aware of its existence. 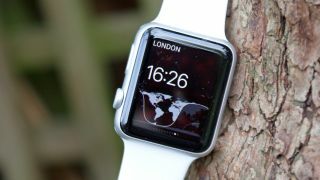 As it starts to appear in retailers such as John Lewis, then Currys and maybe eventually even the likes of Urban Outfitters, the Apple Watch should move from middling success to must­ have. That's if Apple is willing to take the risk and crank up supply. This has been the Watch phoney war so far; Christmas will be the real battleground.